If you haven’t seen it there is a short introductory video for this here. When you arrive at the audition, you will be greeted by a member of our team who will support you through your audition day. They will introduce you to the accompanist so that you can warm up and get used to playing with them. 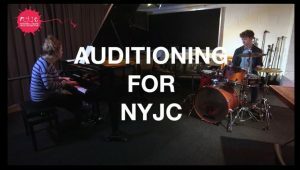 Three people will be with you during your audition; two adjudicators and a jazz pianist (who will be accompanying you in your pieces and running some of the practical aural tests). All three are keen to make sure your audition is as relaxed and creative as possible, so please do tell us if we can do anything to help you during your audition day (including any special access needs you might have). a) A simple blues: Perform a head (the main tune) and three improvised choruses of a mid tempo blues in F (from memory i.e. without using a lead sheet), which will be accompanied by the jazz pianist. To read more about the Blues click HERE. b) Perform TWO contrasting pieces lasting no more than a total of 8 minutes. For advice on repertoire click HERE. To read NYJCs graded list of tunes click HERE. Both pieces should begin with an opening ‘head arrangement’ (i.e. a melody, accompanied by a chord progression). This should then be followed by an improvised solo section, which is based on the same chord progression as accompanies the opening head (In both pieces, drummers will be expected to accompany the head, take a solo and trade four, two and one bars with the pianist). Candidates are invited to perform an original piece as one of their two selected pieces. c) Ear test: listen to a couple of short phrases played twice on the piano. You will then be asked to play them back on your instrument (or sing them back if your main instrument is voice). d) Improvisation and harmonic understanding. We ask you to improvise over two simple chord progressions written especially for the audition, using accessible, standard jazz harmony. The first will use a simple progression of up to four chords, which will be repeated by the pianist, so that the candidate relies on their ears to work out the changes. The second will be a notated progression of up to eight chords using chord symbols. e) Take part in a short conversation so we can hear about your individual interests. We’d like to encourage all candidates, where possible, to play their two prepared pieces from memory, so that they can really focus on improvising over the chord changes and interacting with the accompanying pianist. However, this is not obligatory and use of a lead sheet for these two pieces will not influence the outcome of the audition. For an example of a lead sheet click HERE. All candidates will be expected to provide appropriate concert lead sheets for the accompanying jazz pianist. For an example of a lead sheet click HERE. In the case of piano or guitar auditions, the provided piano accompanist will take on the role of a jazz bass. Drummers will also be asked to play a variety of grooves and feels (using sticks, brushes and mallets) from a specific list of grooves found HERE.